The Dallas Mavericks Mens Ultimate Pre-Game Short Sleeve Tee Shirt is the latest basketball top from the Adidas NBA On-Court Collection and is constructed from 100% 4.7 oz. polyester material that keeps you cool and dry during your workout and also helps to keep you smelling good no matter what your activity. 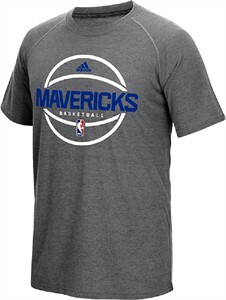 An official NBA authentic Pre-Game shirt for the Mavs this Dark Grey tee comes with a slim-fit body and features a raglan body and a team specific graphic that will be worn on the court during pre-game activities.